Stunning property w/RV/boat parking along 3 sides! New 16x20 Stor-mor shed/shop! Enjoy private backyard w/complete country feel! Fully fenced, landscaped, extensive curbing, full rain gutters, dog kennel, no rear neighbors, low cost irrigation water & no HOA fees! 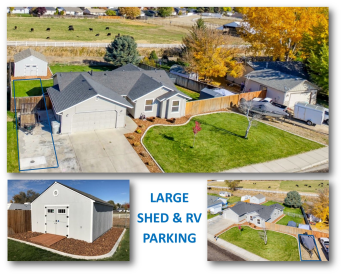 Extra wide & deep driveway w/RV gate! Brand new ROOF, FURNACE & AC! Newer interior & exterior paint! Vaulted Fam Rm w/new ceiling fan & light fixtures. Open kitchen w/walk in pantry! Spacious master suite w/dual sinks & closets. Great location!